Toyota has been one of the most impressive brands in the world of racing while also being one of the most admired and trusted brands on the road. The new 2020 Toyota Supra will be the sports car that’s going to carry on the name we love and give us the feeling we want when it’s time to head out on the track and let this car loose. While we wait for the first model of this car to arrive on the market, we’re now being offered a view of something spectacular from this brand. There was a time when we saw the new Toyota Supra offered in its racing version when the Geneva Motor show arrived. This was about a year ago and now Toyota has done it once again. 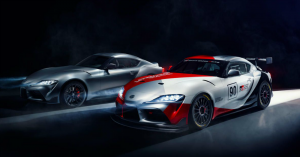 This time, they seem to be more serious about the racing version of the Supra and brought the new Supra GT4 that can be the perfect vehicle for teams that will race in the class of vehicle of the Supra can experience when it’s time to head out on the track and head to the front of the pack. What you’ll see in the video below is a new Toyota Supra GT4 that’s a concept which looks and feels a lot like the street car. This stylish racing machine offers the aerodynamics you expect and a feeling of aggression that comes with the territory, but you do see the same dashboard screen as what’s found in the street model of the Supra. This car is ready to take on the likes of the Nurburgring 24 Hours race and it will be part of the GT500 class in 2020 where it will participate in the Super GT series. The GT4 will be found in as many races as possible over the next couple of years. This car will compete in the IMSA Michelin Pilot Challenge along with the Asian series including the Blancpain GT World Challenge and the Super Endurance Series races. The powertrain in the race car is the same as the one in the production car and it has been tuned up and tested to be made right for the racing that will take place. Enjoy the video below and get ready to see this incredible car ripping off some fast laps later this year.